QR codes are an excellent way of driving users to content, protecting your technical publications and driving up user engagement with our content. 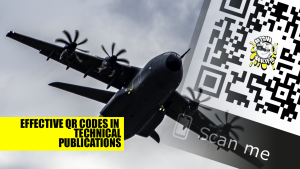 In this course we are looking at the Effective use of codes in traditional technical publications. We start with looking at what these codes are and the role they play, the types and categories of codes available to us and how they are generated, published, managed and updated. We then move on to looking at the specifics of the aerospace, defence and space use cases for usable QR codes, examples of where they can deliver real value and ROI. The course then moves on to practical applications and implementation of codes in technical publications, we start with creating our own codes then we look at how to incorporate QR codes into a CMM and then move on to how you may be able to use them within an S1000D environment, from a data module to a publication module. By the end of this course you will fully understand the role that these codes play in information availability and access – you will also understand how they can be used within a technical publications environment as well as the full range of codes available for use, how to create them and how to manage them. For more information on this course you should visit the TD-iQ website HERE, subscribers will be able to enrol on this course via your TD-iQ dashboard as soon as the course is made live. For more details on membership plans and accessing this and similar courses, please see our JOIN TDW page. If you would like more information about TDW, joining or accessing our resources you can email us at Member Services for full details.